Our bartender was a very nice lady named Angela, who has worked at the pub for ten years and is finishing her graduate degree at Portland State. I also had a very good Engleberg Pilsner from Upright Brewing Company in Portland. According to Angela, their evening clientele is very mixed and interesting. One can see earthy-types of all ages, professors, students and neighborhood yuppies. There is a small room separated from the bar by a neat corridor with two pool tables and video machines. 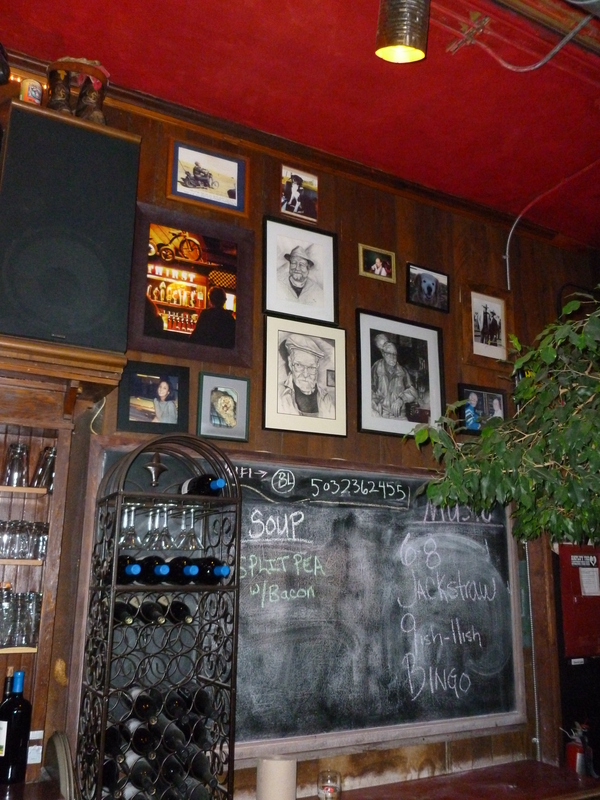 Adding to the nice environment were a number of sketches and paintings from various local artists adorning the wall – exhibited on a rotating basis (Janet Julian, a musician who has played at Laurelthirst, was the featured artist when we were there). 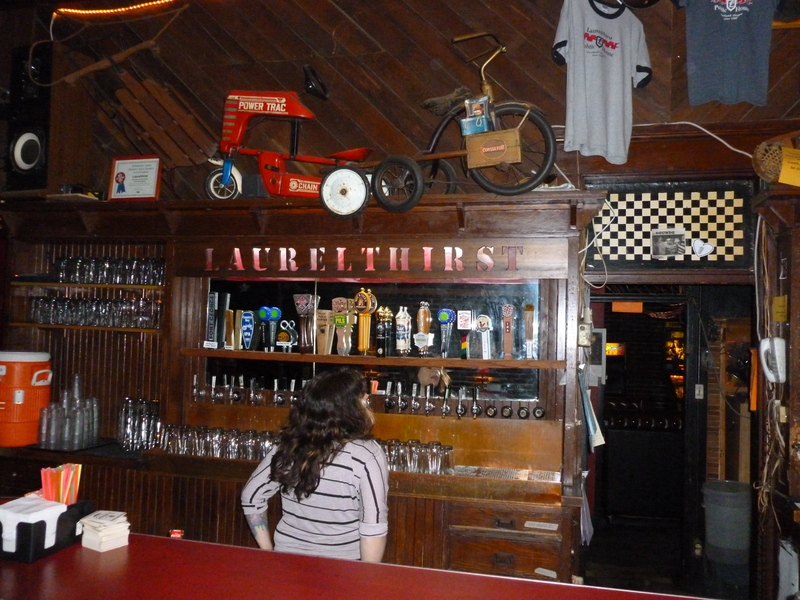 Besides the unique and homey environment, the music also differentiates Laurelthirst from many neighborhood bars. 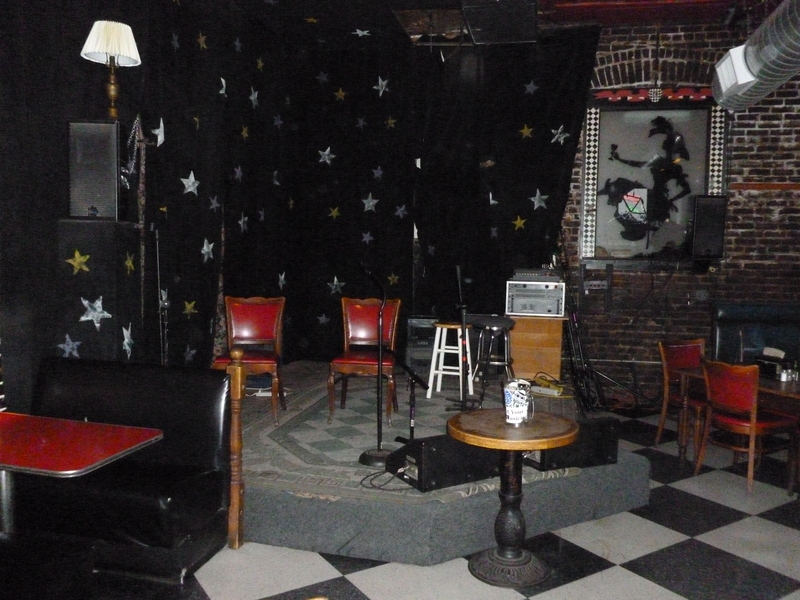 A very small stage in the main bar area hosts the bands which range from bluegrass to jazz. When there are quality groups, the area can become very crowded with observers and dancers — but that adds to the charm. 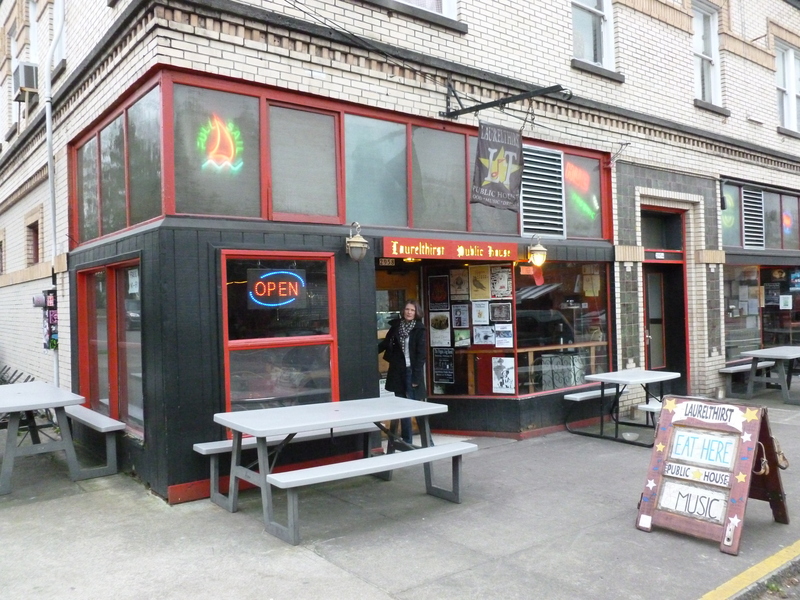 Whether it is to hear a good band, sample a NW microbrew or have a good breakfast, the Laurelthirst is a neighborhood treasure in NE Portland. Laurelthirst Public House 2958 NE Glisan St. 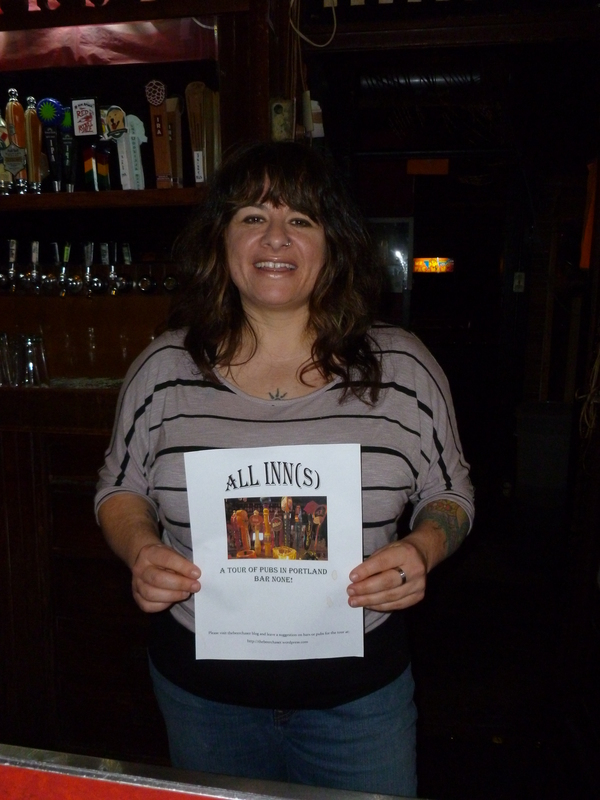 This entry was posted in Neighborhood Bars and tagged Hub Crosstown Ale, Janet Julian, Jimmy Boyer Band, Laruelthirst, Lewi Longmire Band, Michael Hurley and the Croakers, Portland Country Underground, Upright Brewing Company by thebeerchaser. Bookmark the permalink. Sounds like a great spot. 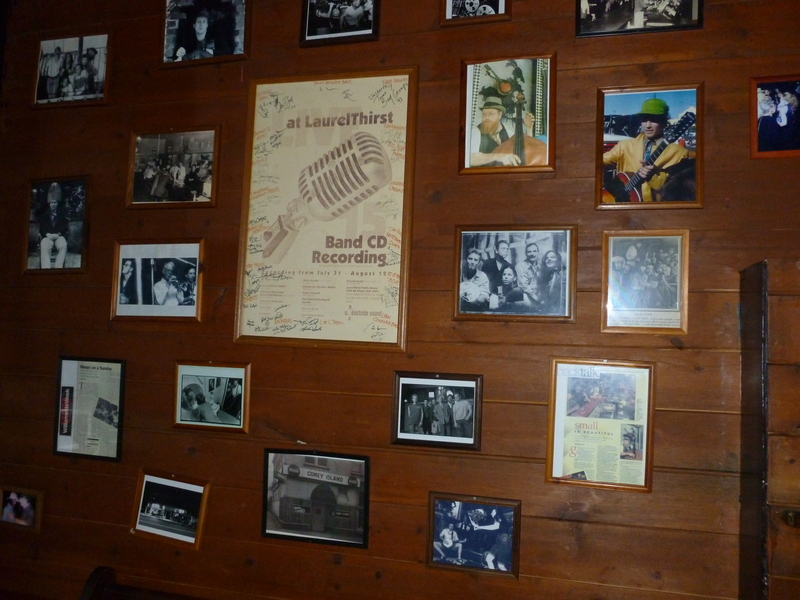 Reminds me of a wonderful Sellwood pub, the Muddy Rudder, on Tacoma St just on the east side of the Sellwood Bridge. Cosy, great neighborhood atmosphere, and some excellent bluegrass music. Good beer and food too. Thanks David. From my “research” I have learned there are a number of other bars in Sellwood besides the Yukon which I have already visited. 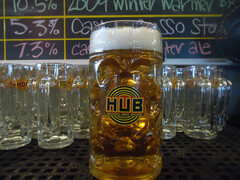 The Leipzig and the Muddy Rudder sound like another multiple-stop option on thebeerchaser tour this spring. Keep your schedule flexible! !